Coyote at Large shatters the misconception that nature writing-works that seem limited to expressing conventional awe, reverence, piety, and wonder-is a humorless genre. In this important and surprising book , Katrina Peiffer reveals and explores the comedy and humor long overlooked in traditional and contemporary environmental literature. Edward Abbey, Louise Erdrich, Wendell Berry, and Rachel Carson, whom the author dubs "comic moralist," command center stage in this study. 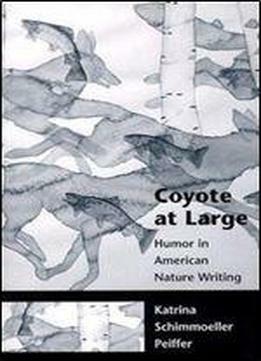 But in playful textual interludes, the trickster-coyote of native American mythology appear in the wings, roaming at large through the prose and poetry of Simon Ortiz, Ursula Le Guin, Sally Carrighar, and Gary Snyder, proving a recurring analog of how comedy and humor show themselves in the larger canon of American nature writings. Lively writing coupled with a delightfully wily approach make Coyote at Large an engaging and enlightening read for ecocritics as well as students of American literature.